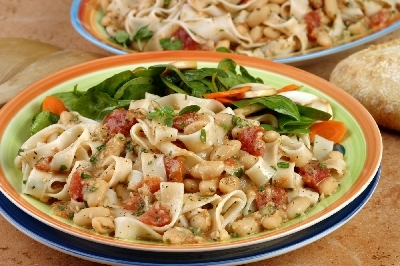 Rice pasta and beans pack this classic dish with goodness and flavor. Canned beans makes it an extra fast meal to prepare. 2. In a large skillet heat oil over a medium high heat. Add garlic and sauté until soft. Roughly purée one can of beans with liquid and add to garlic. Drain second can of beans and add to skillet along with oregano, salt and pepper. Stirring frequently, cook until just heated through. 3. Add diced tomatoes to beans and stir to combine. Simmer on low heat for 5 minutes. 4. Boil Notta Pasta according to directions on box. Reserve 1 cup of pasta water and drain pasta. Rinse briefly with cold water. Add pasta to skillet with parsley and Parmesan. Stir briefly to combine.If a thinner sauce is preferred, stir in one half or all of the reserved pasta water. Divide Pasta Fagioli between 4 bowls and serve immediately.